Can I use Kodak black and colour ink cartridges in an HP Photosmart C5200 printer? Provided that your printer was purchased in the UK, the cartridges you require for the HP Photosmart C5200 printer are the HP 350 or 350XL black and the HP 351 or 351XL colour. We're not aware of any Kodak cartridges that will work in a Hewlett Packard printer and would not recommend that you install cartridges in a printer unless you're 100% sure that they're compatible. I've been given a HP C5200 printer but there are no leads for it. Could you tell me which leads I need and where I can get them please? Thanks, Mr. J. Warburton. Unfortunately, as we do not stock printer leads we're unable to advise which one you will require for the Photosmart C5200 printer. However, this should be listed in the printer manual or if you contact HP directly they should be able to advise further. If you've not received the manual with the printer, this should be available for download on the HP website. When the Photosmart range first landed, the world of home printing changed forever. It cannot be denied that Hewlett-Packard really did come close to reinventing the wheel with the Photosmart printer, but as new models are brought out, what can they bring to the already rather impressive table? Well, the HP Photosmart C5200 fits very nicely into the Photosmart range as it boasts many perks. Here is a brief rundown of the HP Photosmart C5200 and everything it has to offer. 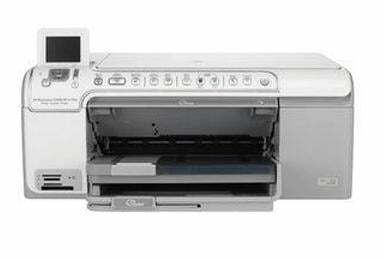 In design terms, the HP Photosmart C5200 is actually pretty out there by home printer standards. Most home printers rely on a dark, almost dingy exterior in order to create a subtle feel but the HP Photosmart C5200 is actually a very daring cream colour. The design concept of the HP Photosmart C5200 has been very well thought out and a lifting lid conceals a scanner function. The user interface is also very simple, and it lifts in out of the roof of the printer for a better view. I can come clean, I have actually owned a HP Photosmart C5200 personally for a few years and can safely say as a result, this printer produces brilliant results. Both regular documents and photo-paper print outs are stunningly clear and anyone who is after a fine home based photography unit could do well to consider the HP Photosmart C5200. The disadvantages of the HP Photosmart C5200 are few and far between, but one which might crop up from time to time is the amount of ink it gets through. This could prove costly too, but as long as you're after quality, then there is no reason not to invest in a HP Photosmart C5200.